Marking Lion Music's 300th release; guitar virtuoso / composer Lars Eric Mattsson returns with the ultimate neo-classical experience in which metal and rock guitar, bass and drums meets classical music for the harmoniously rich ‘Aurora Borealis’. This new wholly instrumental 12 track release takes a fresh approach to the blend of guitar and orchestra for a musical experience as uplifting as seeing the wonder of the northern lights, from which the album gets its title. Whilst the combination of orchestra and guitar may have been done before by amongst others one of Mattsson’s influences Uli Jon Roth; ‘Aurora Borealis’ takes the range of sound and expressions further that what has been heard before and places as much emphasis on each tracks backing as with its guitar work. The result is a highly captivating and listenable experience. Lush in textures and timbres, ‘Aurora Borealis’ comes across at times like a film score; sometimes fast and exotic whilst at others sweet and luxurious. Many moods are covered and all of which see Mattsson deliver impassioned guitar work in his own inimitable style. Mattsson made a big point during the albums compositional stage to deliver an album that could theoretically be performed live within the right setting. To achieve this there is only ever one guitar heard at a time, sometimes playing the lead part but not always. Lars Eric Mattsson comments, “I tried to compose the music with enough variations and the right flow from start to end and keep things listenable by using the right arrangements”. To ensure his guitar would work as cleanly as possible with the orchestral parts Mattsson kept his signal chain as pure as possible with only the occasional wah pedal between guitar and amp (with some delay and reverb added in post production). The result is a clean sounding release with strong dynamics and a wide tonal palette. Despite its relative complexity ‘Aurora Borealis’ may well be easier on the listener than some of his previous vocal progressive metal releases such as 2010’s critically acclaimed ‘Mattsson – Tango,’ although Lars concedes with a smile, “It might sound less complex though I am not sure it actually is!”. As a final comment when asked to sum up the new release Mattsson responds, “Classical music and rock has been mixed before with various results but never this way, I tried to create something very unique and I don’t think it’s fair to label this as just another instrumental guitar album”. 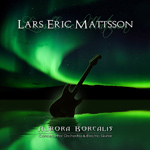 ‘Aurora Borealis’ sees Lars Eric Mattsson almost halfway through his third decade in the music business with a new release that is testament to his vision and appetite to ever expand his musical horizons and does so in fine style. ‘Aurora Borealis’ sees release on Lion Music on 15th April 2010. Lars Eric Mattsson – Guitars, bass, keyboards.